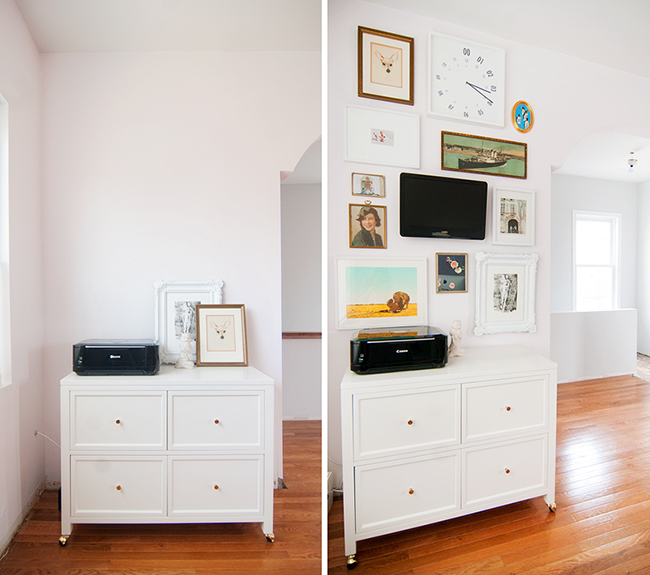 It’s no secret that the gallery wall has picked up in popularity with a vengeance over the last several years. 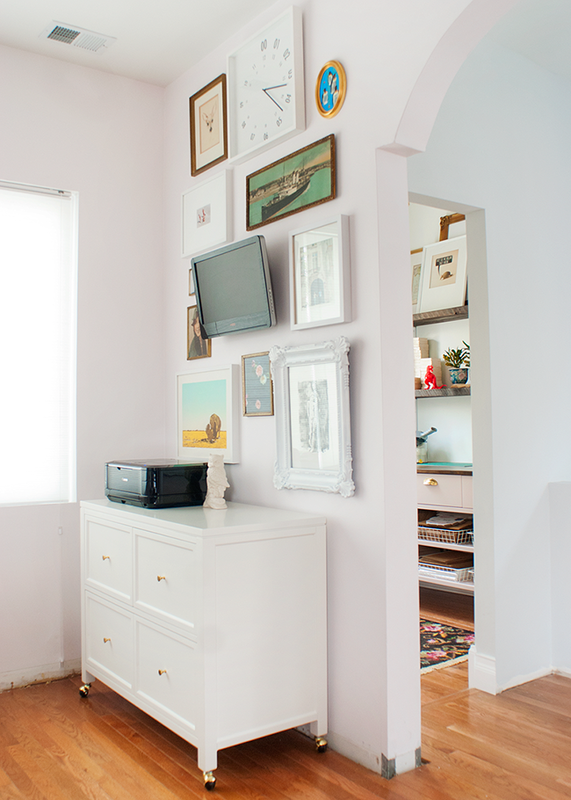 What began as a simple way to show off your family photographs along the staircase has now become a staple in any area of the home – from a colorful display around the television, above the bed or your cozy kitchen nook, gallery walls are here to stay. Some of my favorites feature an eclectic and collected look; they’re seemingly effortless, and yet, do you find yourself struggling to find that same balance? 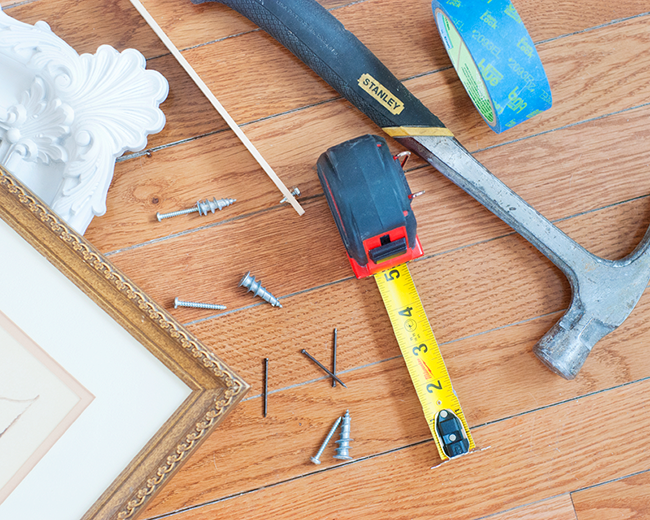 With a little bit of prep, you can put together that perfectly imperfect wall in just a few simple steps! Set yourself up with the proper tools. Are you looking for streamlined or varied? This is something to keep in mind from the beginning, as it will help you determine your overall look. 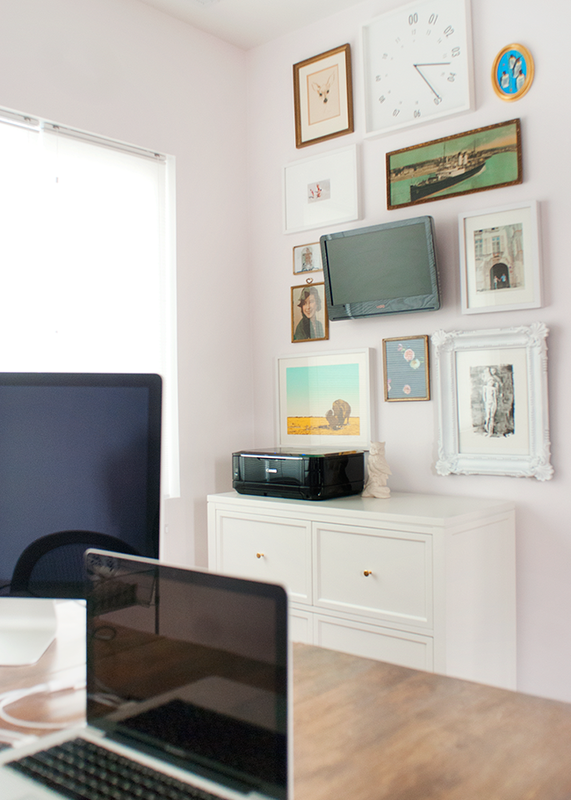 In my case, I wanted my gallery wall to feel gathered and inspiring, while also pulling double duty to conceal the television in my home studio. To start, I grabbed from my stash of thrift store and store bought frames and set them to the side. Stage your space. 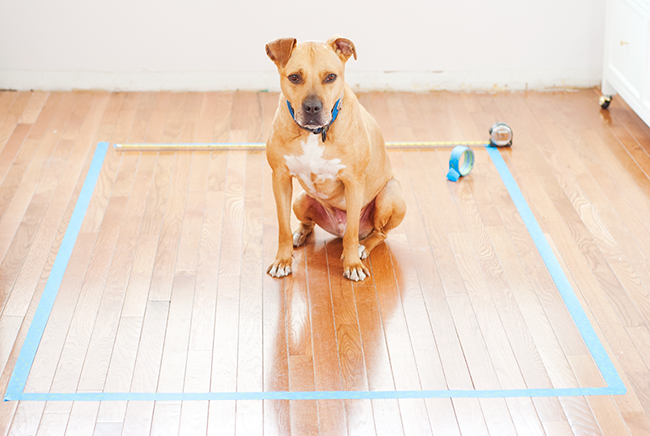 My gallery wall was going on a 4’ x 6’ space above my filing cabinet, so I measured and laid out my work area on our floor using blue painter’s tape. In my experience, this method is much more effective (not to mention, quicker!) than making paper templates of your frames. 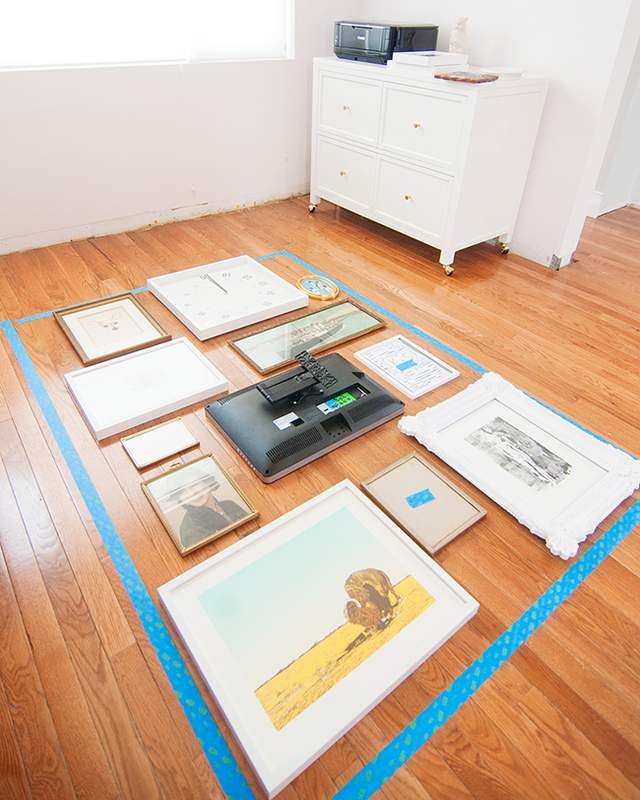 At this point, not all of my frames had their final artwork or photographs in place, so I marked with blue tape which frames still needed prints made or mats cut. 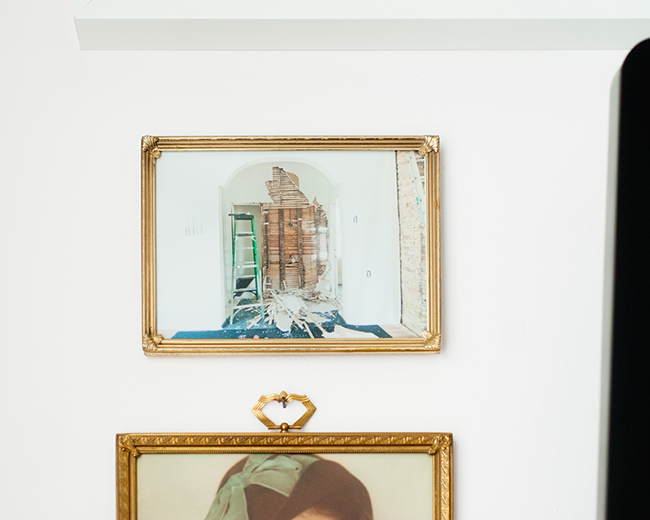 If your frames are already filled with what you love, keep this in mind as you curate your arrangement, but don’t force something to fit if it simply will not. 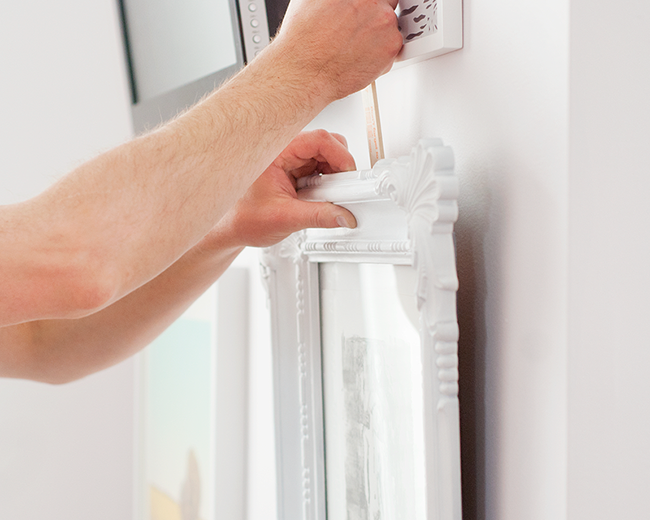 Some of your frames might not make the cut, but that’s okay! Don’t worry about frame finishes at this point, as they can always be spray painted to your liking, if you wish. Take a photo with your phone. Once you’re happy with your frame layout, snap a phone photo. You’ll use this for reference throughout the installation. 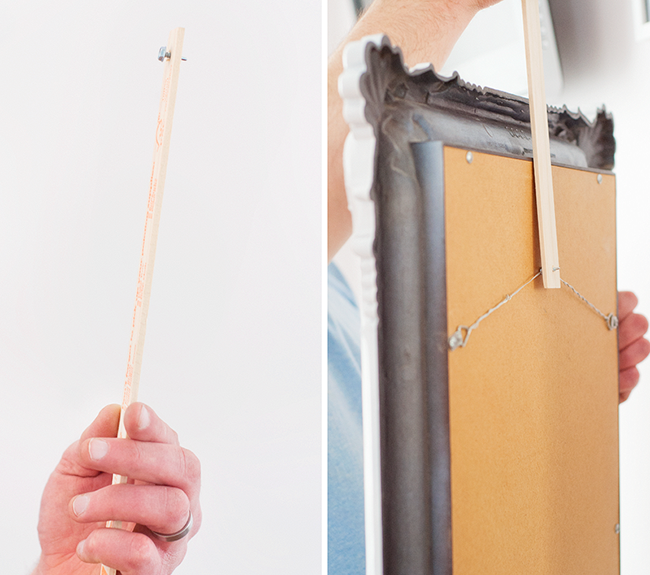 Because all of the frames have different hanging hardware, I used a paint stirrer with a screw to find that perfect placement – no measuring required! With the frame wire on the screw, I gently push the frame against the wall, leaving a small mark where my nail should go (as my husband so graciously demonstrates). A gallery wall has a purposeful gathered look, so I encourage you to use just your eyes and your phone photo as needed. If you have a non-negotiable within your gallery (in my case, the television), I’d recommend starting there and working outwards. Remember to use anchors for heavier frames! If at this point you still need to order prints, photographs or any artwork, you’ll already have the majority of the work done! 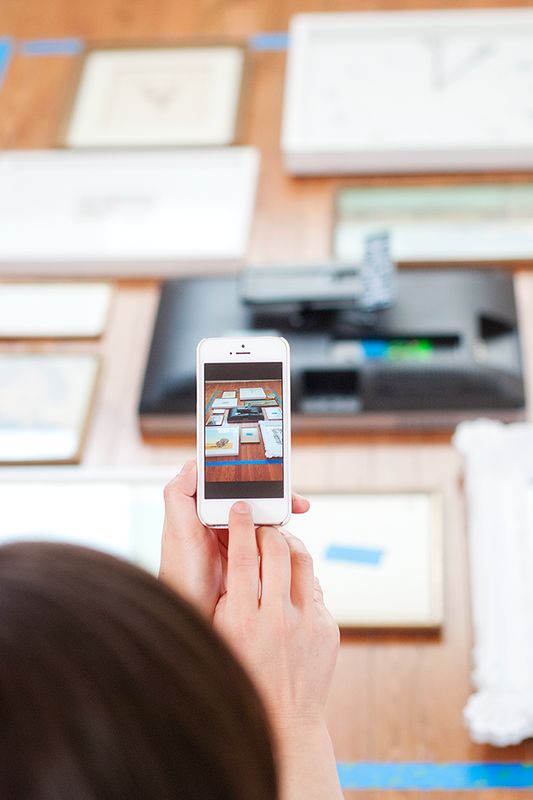 I find that it’s better to curate the aesthetic look of your gallery first, rather than hope, for example, a horizontal print will fit in a vertical space. 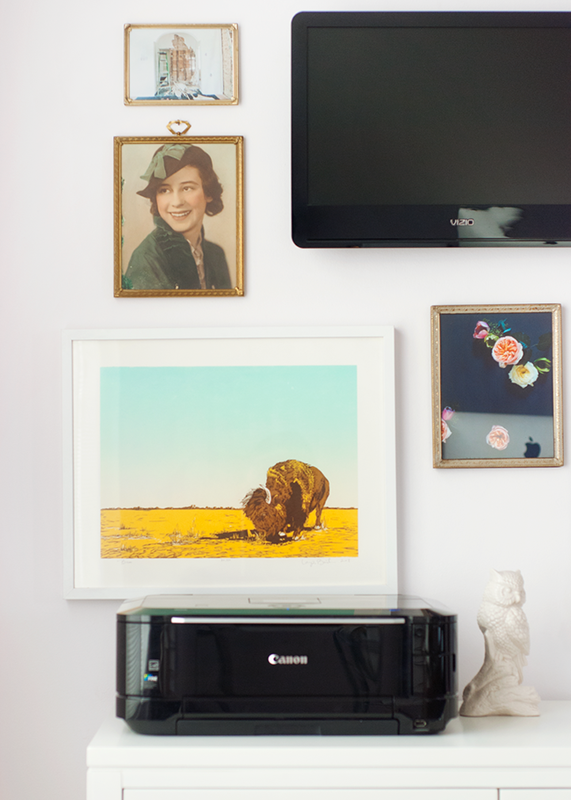 My collection includes memories and artwork that I adore – from vintage photographs to friend’s art, to a Pinhole framed photo of my husband and me in Paris and even an antique print we purchased while there. 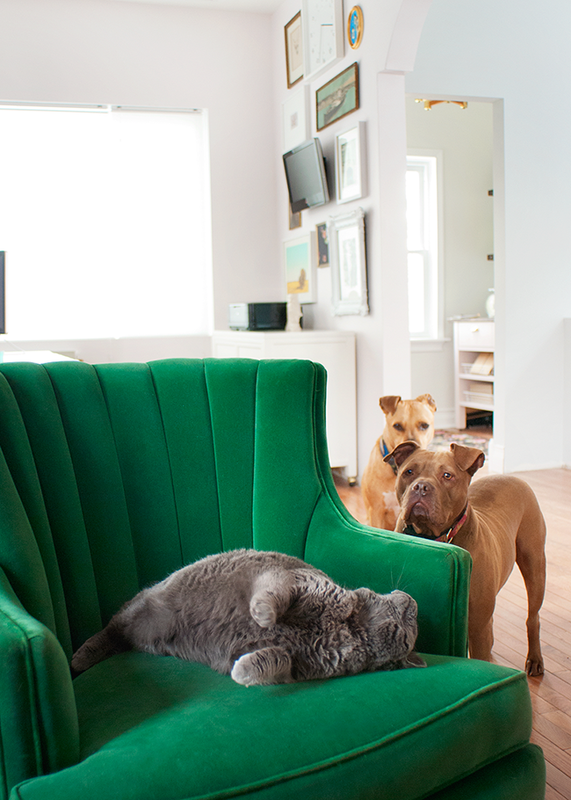 Perhaps my favorite photo is a small shot of our home’s renovation journey, taken in the same room as the gallery wall! 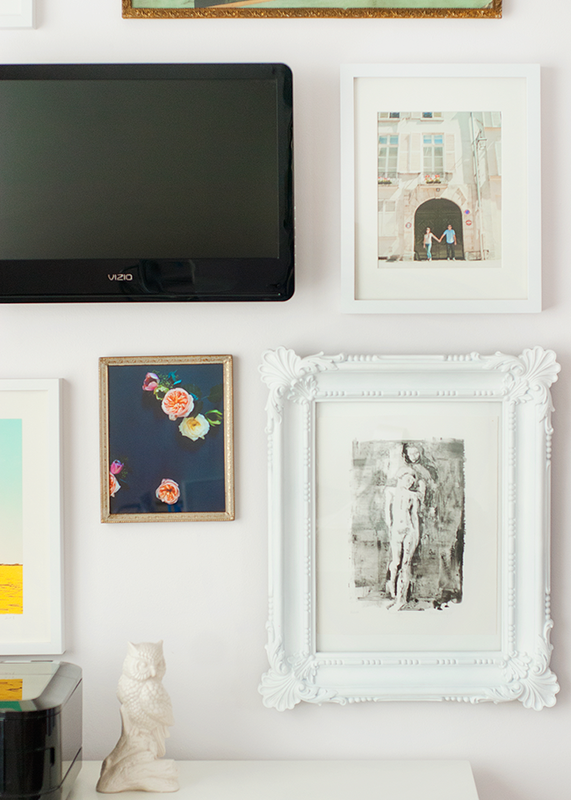 Curating your own gallery wall doesn’t need to be difficult, rather, it should reflect your personality and display pieces close to your heart. Whether you’re going for inspirational, quirky or humorous, remember to – what is it that I always say? – have fun with it! Next Next post: 3 Ways to Unplug with Your Child! They’ll Love You For It.